Needles and Pens celebrates 10 Years! 05/08/2013 Comments Off on Needles and Pens celebrates 10 Years! I’m proud to be included amongst this ocean of talent. A standing ovation goes to Needles and Pens for creating and maintaining such an amazing legacy. Show your appreciation this Friday at The Luggage Store in San Francisco! 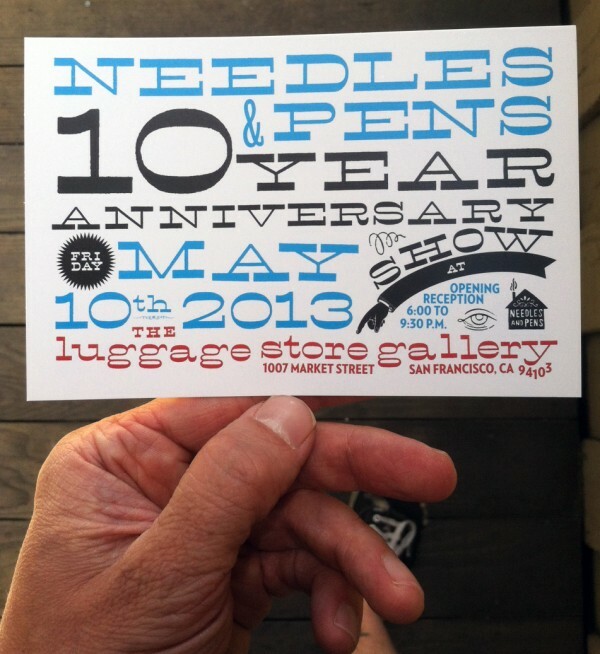 Opens May 10, 2013 – 6:00-9:30 p.m.
You are currently reading Needles and Pens celebrates 10 Years! at Kevin Earl Taylor. Comments: Comments Off on Needles and Pens celebrates 10 Years!